These no-bake chocolate peanut butter cup donuts require just 7 simple ingredients and can easily be adapted for vegans! Where can I even begin with these donuts? They’re kind of leaving me speechless. You like donuts, right? And chocolate? And peanut butter? If you answered yes (and I presume you did, otherwise you wouldn’t even be here right now), then you are about to be transported to donut heaven. These date- and nut-based donuts are a delightful and decadent treat, especially with a homemade chocolate peanut butter cup on top. Wow. The recipe is quite easy and requires just 7 ingredients. The most time-consuming part of assembling these beauties will be shaping the donuts and making the peanut butter cups, but in all honesty, you can skip the peanut butter cups if you like (but don’t!). Personally, I think these closely resemble a cake donut, both in texture and taste. And speaking of taste… even better than a real chocolate peanut butter cup. I’m not even joking. Finely chop a big handful of dates in a food processor. Toss in some almonds and cashews and process until finely chopped. Then pour in an insane amount of (natural) peanut butter and process until combined and the “dough” sticks together (if you want to sweeten the dough slightly, add 1/2-1 tablespoon maple syrup; this is optional). If the dough isn’t sticking/seems too dry, add in a bit more peanut butter. Stir through some chopped dark chocolate. Scoop out the dough and fill the holes of two greased (with a small amount of coconut oil, or butter) donut baking pans about halfway up. Freeze (15 minutes) or refrigerate (30 minutes) until firm. Meanwhile, make the peanut butter cups – melt chocolate and pour it into mini cupcake liners (placed in a mini cupcake pan, of course), freeze until set (10-15 minutes). Stir together a few tablespoons of peanut butter and sifted icing sugar, then spoon this into the set chocolate cups. Pour over a little bit more chocolate to cover the peanut butter filling and freeze again until set (15-20 minutes). Unwrap them when they’re all done. Hm… now I suppose you have two choices here. When the donut dough is firm enough, you can tip it out and shape it into smaller, thinner donuts… or you could do what I did and mold the dough from both donut pans into one huge donut (just kind of gently smash the two flat sides together and pinch around the inside and outside edges, then smooth the pinched bits down). Oh, and here’s a tip – some of the dough wouldn’t tip out of the pan, I noticed, in which case, if you give it a little twist with your fingertips, it’ll help loosen it up. Or, maybe dipping the bottom of the pans into warm water would melt the coconut oil/butter which should help the dough slide out. Either way you go with the donuts, freeze them again. You’ll need to have them quite firm to dip them into the melted chocolate so that they won’t fall apart. FINALLY, melt some chocolate, carefully dip in the tops of the donuts and set aside for the chocolate to set. If you like, scoop some of the chocolate into a ziploc bag, snip off a small bit of the corner and drizzle some chocolate on top of the donuts. And, to stick the peanut butter cups on top, cut them straight from the freezer with a super sharp knife (if they’re at room temp, you’ll just squash them rather than slice them) into four pieces, and put a small dab of melted chocolate on the side of the cup that you want to sit on the donut; the melted chocolate will act like glue and hold it on. By the way, you’re going to have a bit of leftover donut dough. Originally, I was going to scale it down for the official recipe on this post, but then I realized that you can’t make donuts and not have donut holes, soooo…. just roll up the remaining dough and dip them in chocolate, too! Ta-da! Instant donut holes! Haha! If you really want the donut shape, you could pat the dough into a big, thick circle and cut out rounds with a cookie cutter, then use a smaller cookie cutter to cut out the middle. You’d just need to shape it into a more roundish donut-shape on the edges. Just skip the donut shape altogether and make bars. Roll the dough into balls, dip the balls into the melted chocolate and you’ve got healthyish chocolate peanut butter cup truffles! By the way, you can make these completely raw and vegan by using the appropriate ingredients. You can also make your own peanut butter and chocolate, if you prefer… I didn’t quite want to go all out myself (after all, I’m not vegan!) so the donuts in my photos are coated with my favorite absolutely not-vegan chocolate! Totally stick-to-the-roof-of-your-mouth peanut buttery goodness! 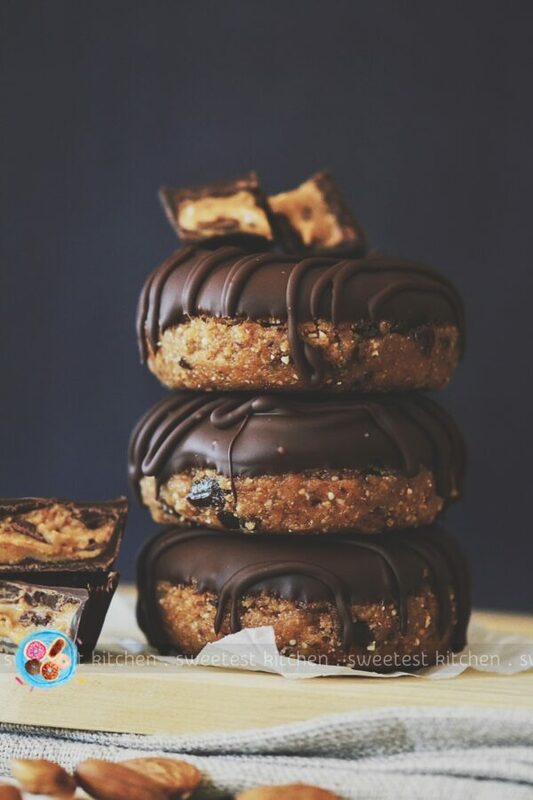 You’re going to want to make these no-bake chocolate peanut butter cup donuts for the perfect grab-n-go snack; they’d be great for a pick-me-up in the afternoon at work (and just think, you’d be the envy of all your co-workers!)! Process dates in a food processor until finely chopped and they start to form a ball. Add the almonds and cashews and process until finely chopped and thoroughly combined with the dates. Pour in the peanut butter and maple syrup (if using), then process until completely combined and a dough has formed that will hold its shape. If the dough seems too dry or crumbly, add in a little more peanut butter. Stir through the 70g of chopped chocolate. Grease two donut baking pans/molds with a little bit of coconut oil (or butter) and press dough about halfway up the donut molds. Press firmly! Place the pans in the freezer for about 15 minutes to firm up. Note, you're going to have leftovers; you can roll the remaining dough into "donut holes" and dip in chocolate later! Meanwhile, start making the peanut butter cups. Melt the 150g chopped dark chocolate in a heatproof bowl set over a pan of simmering water (don't let any water get in the chocolate! ), stirring occasionally. Line a mini cupcake baking pan with 9-10 mini cupcake liners. When chocolate is melted, place 1 teaspoon of the chocolate in the liners and, using a small spoon, smear the chocolate up the sides of the liners (not quite all the way to the top, though). Freeze for 15 minutes until set. Set the remaining chocolate aside. Make the peanut butter filling by stirring together the peanut butter and icing sugar until combined. Place a slightly-rounded teaspoon of the peanut butter filling into the chocolate cups and smooth the top down. Lastly, pour another 1 teaspoon of the melted chocolate on top of the peanut butter filling and spread it out to completely cover the tops. Freeze until set, about 20 minutes. Meanwhile, gently invert the donut pans to remove the dough. If the donuts are having trouble coming out, you can either dip the bottom of the pans into warm water to warm up the coconut oil/butter, which should help the dough slide out... or try to give the dough a little twist with your fingertips to loosen the dough from the pan, which worked for me. Here, you can either choose to leave the donuts as they are, and just shape the flat sides to be more round (you'll have 12 smallish donuts), or you can mold the donut halves together as I did (you'll 6 huge donuts). To do this, place two donuts, flat sides together, and gently squash together (but not too hard!). Pinch the seams together along the outside, and inside of the donut hole, then smooth over the pinched seams with your fingers. Freeze the shaped donuts again to firm up, about 20-30 minutes - you'll need them to be very firm to dip into the chocolate without falling apart. Meanwhile, unwrap the peanut butter cups and carefully slice them with a sharp knife into 4 pieces (do this when they're straight from the freezer, otherwise they'll just squash when you try to cut them at room temp). Set aside. Melt the 200g chopped chocolate (you can use the same bowl that you used for the peanut butter cups). Taking the donuts from the freezer one at a time (so that they'll stay very cold and firm), dip the tops in the melted chocolate and set aside for the chocolate to set. 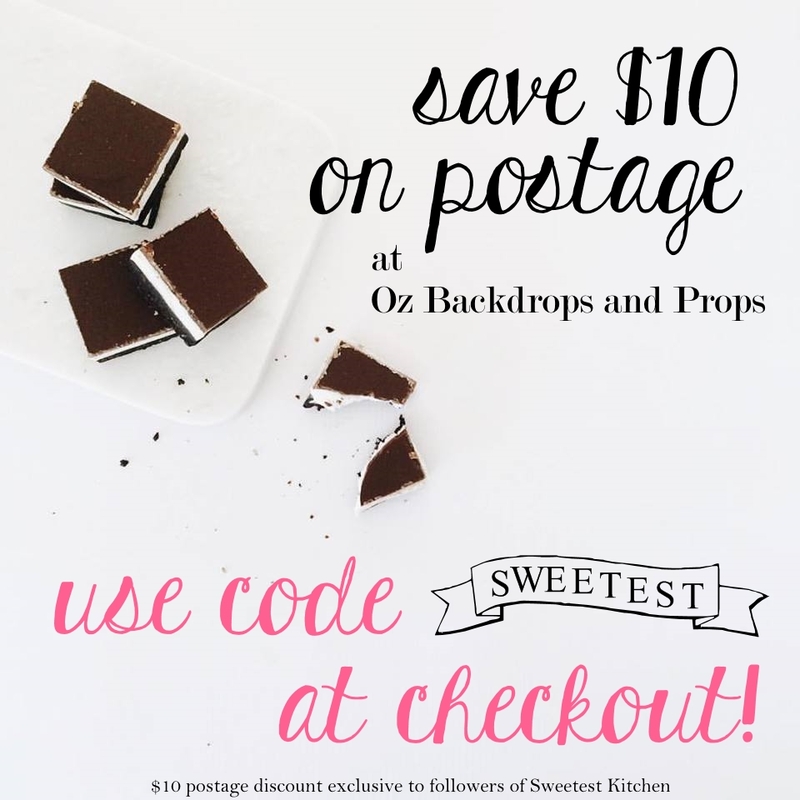 If you'd like to drizzle over some chocolate, as I did, spoon some of the remaining melted chocolate into a ziploc bag, or similar, snip off a small bit of the corner and once the chocolate on the donuts has set, drizzle over the chocolate from the bag. 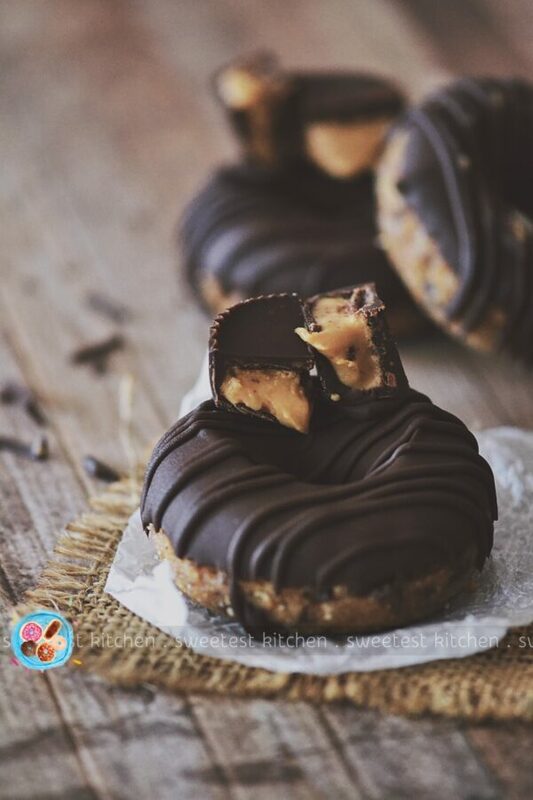 To attach the peanut butter cup slices to the tops of the donuts, place a dab of melted chocolate on one side of the peanut butter cup and place that side on top of the donut; the melted chocolate will set and be like a glue to hold the peanut butter cup slice on top. Store in the refrigerator for about a week; will probably keep in the freezer for longer! * To make this recipe completely raw and vegan, use appropriate ingredients! You can also make your own peanut butter and chocolate, if you prefer. * This recipe was inspired by Rawberry Fields!